When a fund manager advises her investors to invest for the long run, it is only to be expected that she does the same. We’re not talking about how she manages her investments though we sure hope that she invests for the long term too. We’re talking about the way your fund manager makes investments on your behalf and the schemes she manages. As such, your fund manager buys and sells scrips regularly, sometimes every day, to generate a return. But when a fund manager buys and sells far too often, there is a problem. 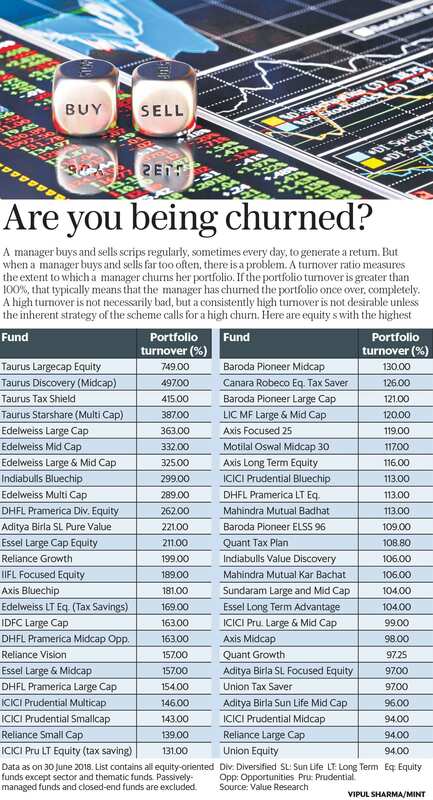 A turnover ratio measures the extent to which a fund manager churns her portfolio. This is calculated by taking the lower of the total sales, or total purchase, and dividing it by the average month-end net assets of the scheme. These are all annual figures, so the result tells the turnover of a scheme over the past 1 year. If the portfolio turnover is greater than 100%, that typically means that the fund manager has churned the portfolio once over, completely.